MACE Had a Big Year! Saved Teaching Jobs for Several Teachers! Protected and Empowered Many! Picketed on Twenty Occasions – to the Delight of Hundreds and Hundreds of Teachers! | Georgia Teachers Speak Out! ← Steve Frey, Aggressive Attorney, Now Represents MACE Teachers! MACE Had a Big Year! Saved Teaching Jobs for Several Teachers! Protected and Empowered Many! Picketed on Twenty Occasions – to the Delight of Hundreds and Hundreds of Teachers! 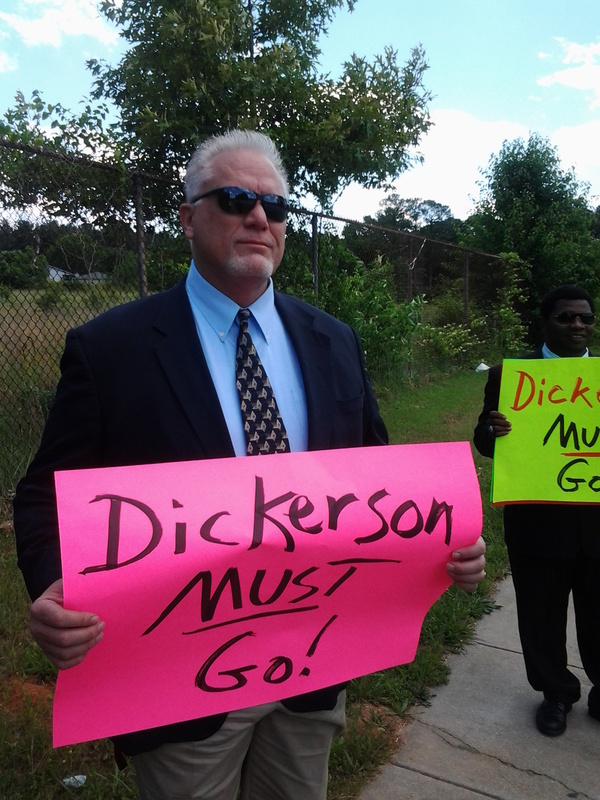 MACE picketed Clayton’s Cynthia Dickerson on the last day of school. MACE finished the 2012-2013 school year in a flurry, with two pickets during the last week of the school year. Cynthia Dickerson, the principal at Clayton County’s Thurgood Marshall Elementary School, had the fine distinction of being picketed by the MACE Picket Squad on the last day of school! This year, the MACE Strike Force ventured into Gwinnett County on five different occasions, with Shiloh High School’s principal, Eric Parker, seeing the most MACE pickets. One teacher whom MACE felt that Mr. Parker was not treating fairly received a transfer to Gwinnett’s Brookwood High School, especially after the promulgation of Dr. Trotter’s almost ten page letter to the superintendent and to all of the Gwinnett County School board members on this teacher’s behalf. MACE picketing on the street in Macon, Georgia! MACE reached up into Cobb County and conducted a wildly successful picket against Floyd Middle School principal, Teresa Hargrett. The Floyd teachers seemed ecstatic that MACE showed up. Clayton County also saw many MACE pickets this year, with the principal at Lee Street Elementary, Zakaria Watson, seeing the most action. 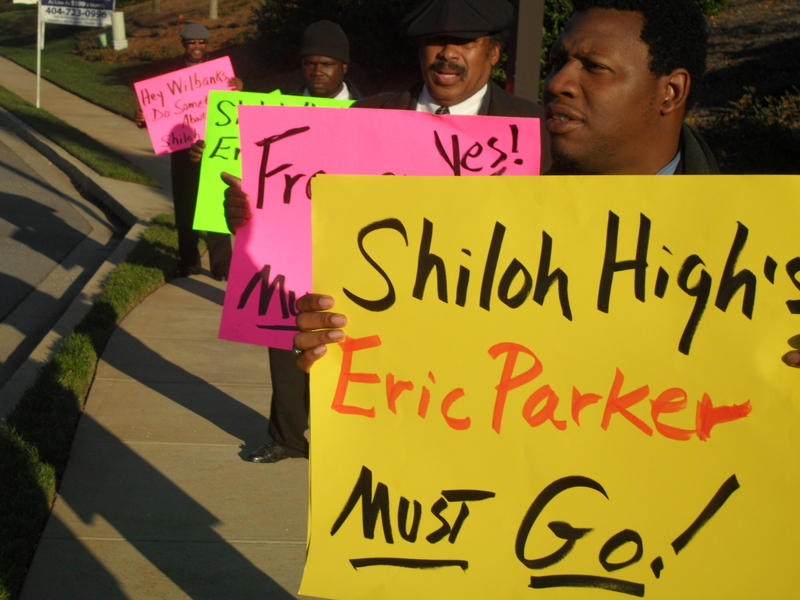 Picketing Shiloh principal Eric Parker and HR Director Francis Davis. 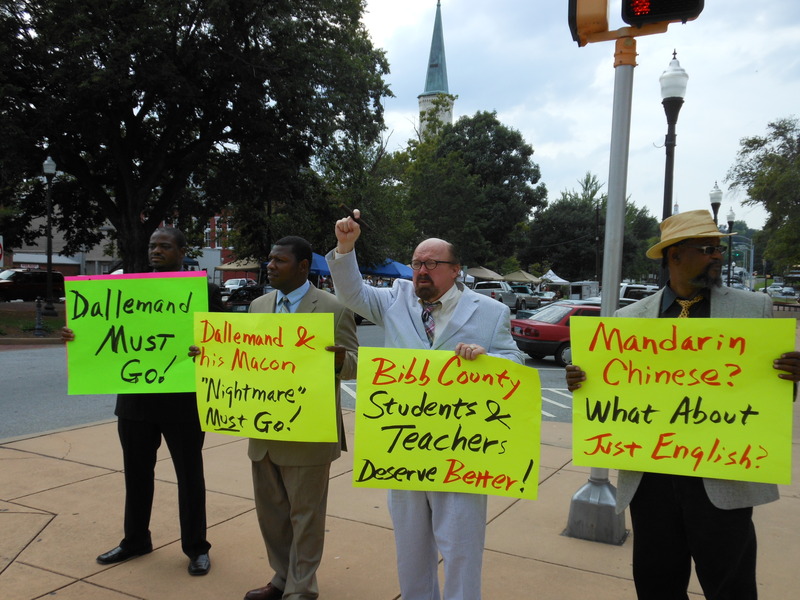 MACE made two trips to Macon, Georgia to picket the very much disliked Romain Dallemand. Both of MACE’s pickets were covered extensively by the media, including the local NBC affiliate on each occasion. After the second picket in January, Superintendent Dallemand announced his resignation a couple of weeks later. MACE plans to have a Teacher Rights Seminar in early September.